In the interest of future, differently chromosomed offspring, everything I bought for baby girl #1 was gender neutral. But when I found out that our 3rd and final baby was yet again a big old double X, I went girl-print crazy. This is Anna Maria Horner’s “summer totem” in tart from her Loulouthi line, and I heart it big time. Like, purchased-8-yards-of-it big time (9 if you count the yard of laminated cotton!) The scale is very large (I think I measured an 18 inch vertical repeat) and lends itself perfectly to upholstery and whole cloth quilts, like this gorgeous one from Anna of Noodlehead. Once again, I got smart and used a tutorial to help tackle this, namely this tutorial from Ashley of Lil Blue Boo. And, much like the carseat cover tutorial, Ashley’s instructions helped guide me through each step even though my glider wasn’t exactly the same. With a project this big, sometimes you just need to know where to start. And it helps to see that someone else has done it and lived to tell the tale too. Like most sewing projects though, this one just ended up being time consuming, but not necessarily difficult. Much like my pregnancies, actually. The large quantity of this print in the room might be a bit “much” for some people (if that’s you, don’t look at my nursery reveal – your head will explode) but I love it. When it comes to color, I say go big or go home! Just don’t go to my home (again with the head exploding issue). Bonus: when you’re done with this project, you have a pretty place to prop up your feet for a well-deserved rest. Don’t you just adore that fabric? I Just bought it myself too and made a lovely bag for a friend of mine with it. 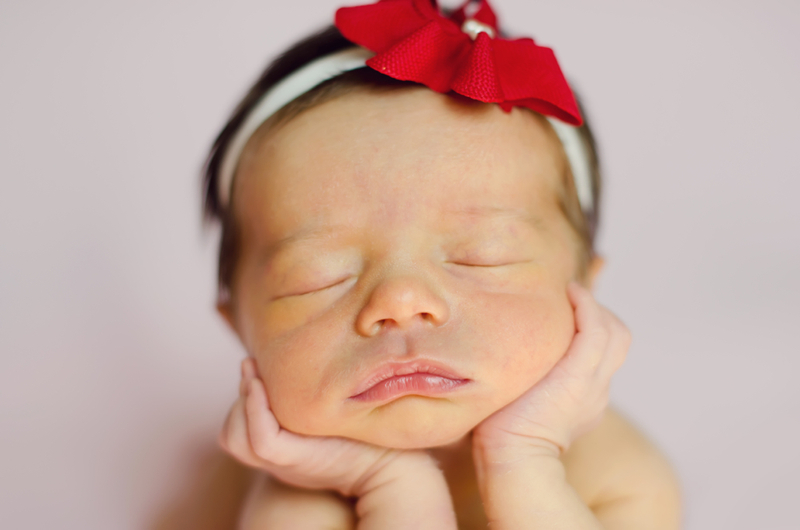 Beautiful job….I love that fabric in that blue room……and what an adorable little baby, love how her hands are under her chin!!! How much fabric did you end up using for the whole project? I’m about to tackle our glider for my new little one and wanted to know. Thanks!! The best way to make sure you don’t buy too much: tear apart your old cover first. You have to do this anyway, and then you’ll know exactly how much fabric you’ll need. You’ll use less fabric if you’re not worried about pattern placement or matching too. Thank you! I was thinking more like 2-3 so that gives me a good idea. I’d rather have too much than run short!! I love large quantity of print…. sooooooo awesome! 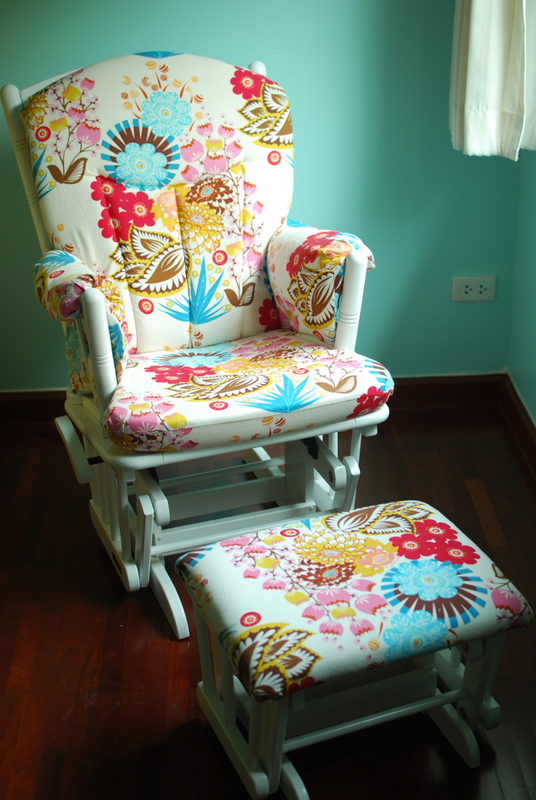 I have a chair in this print too! I LOVE it. 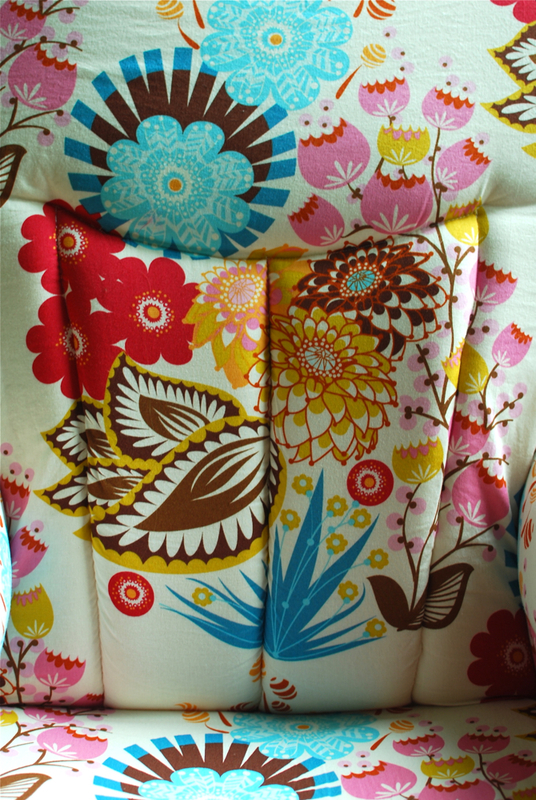 I bet I looked at thousands of upholstery fabrics and nothing came close to this. Unfortunately, my pro put the back piece upside-down. Wah, wah, wah…. WOW WOW WOW!!! That looks amazing!!! 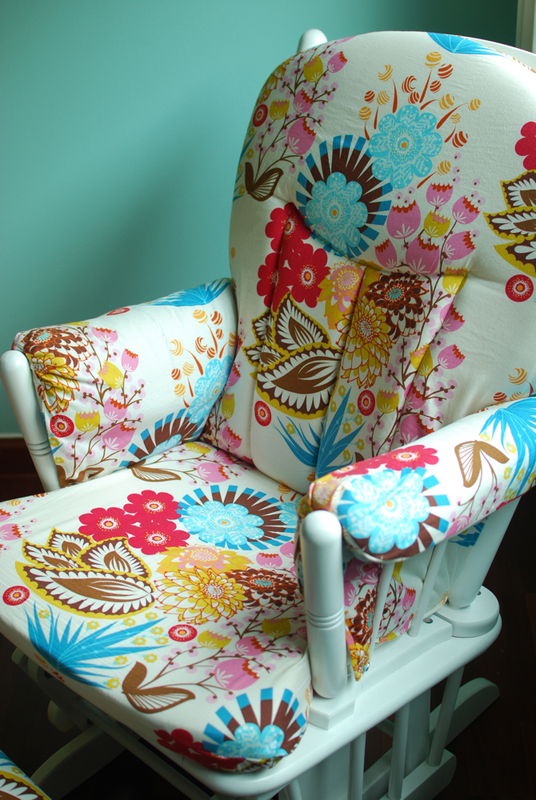 LOVE LOVE LOVE the new fabric on the glider. Looks uh-mazing! Also love the picture of your little peanut. So unbelievably sweet and tiny. I love the fabric you choose. This is amazing! YUM! I just LOVE that chair! I can’t wait to see if our #3 will be girl #3 as well. March is creeping up so slowly! I went a little bit over the top with ruffles and stuff when I found out at 31 weeks with girl #2, and if #3 is another girl when I find out at 20 weeks I fully intend to go just inSANE. You did such a fantastic job! I wanted that fabric for bibs (in the coated cotton) but they were out of stock! Beautifully done! The chair and the baby! Love this!! How did you do the ottoman?? The other tutorial you linked to didn’t have an ottoman. My cushion is attached to my ottoman, so not sure how that would work. Where is the tutorial for this project? Gorgeous! You just inspired me to rehab mine! That turned out amazing! Re-upholstering has always scared me a bit. I’ll have to check out that method. I have one of these and have been looking for new cushions. This is much prettier than anything I’ve seen. Yours turned out beautifully. Love this!! Did you handsew all of those seams in the center? I saw her blog, but I’m still kinda unsure on how to do that part!! Thanks so much for posting..love this print!! Anna Maria Horner’s Loulouthi line, “Totem” – may have to look on Etsy or eBay now?